For one, this weekend’s decider is the opportunity to complete a dream season; for the other it’s the chance to salvage something from a campaign that could (and should) have brought more reward than it has. Faughanvale have been the best team in Derry Junior football all year but Drum have not been far behind. The irony for the small St. Colm’s club is that in any other year, the type of football - and the manner in which they approached this season - would have almost certainly guaranteed success, such was the standard in the Junior grade. 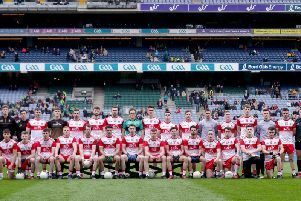 In that respect, Drum have been hugely unfortunate that their best season (performance wise) for many years has coincided with the juggernaut that was St. Mary’s short stay in Junior football. The shock waves that reverberated around Celtic Park in September 2014, when the ‘Vale were relegated from Division Three, have been long forgotten. Many said they were too good to drop down and so it has proved but throughout a season that threatened to turn into one long victory procession for Joe Gray and his players, one team refused to give up the chase and inflicted, thus far, the only defeat on the Greysteel side. Yep, that’s right, Drum. Under the astute leadership of former goalkeeper Jason Hazlett and Foreglen native Kieran O’Kane, St. Colm’s have been rejuvenated after a number of season’s going through the motions. The reaction following June’s league defeat to Glack showed how much they wanted promotion this year, possibly more than even the championship. But last week’s heartbreaking defeat to Moneymore slammed that door shut in an especially cruel manner and it remains to be seen whether St. Colm’s have it left to lift themselves enough for what is a huge challenge against ‘Vale. St. Mary’s have sailed through the majority of this season, far too good for most of the teams they came up against, but not Drum. A keen rivalry has developed between the clubs following that solitary league defeat against St. Colm’s in July. That game ended 0-11 to 0-4 and despite never looking like stopping ‘Vale winning the title, it was a result that resonated with Gray and his players. That was evident when the finalists met in a championship dress rehearsal for this weekend early in the competition. There was an edge apparent even before Barry Cassidy threw the ball in with St. Colm’s paying special attention to the ‘Vale player-manager. What ensued was an intriguing, if low scoring, game. Vale, obviously fired up by that league defeat, were faced by a very specific Drum game-plan which failed largely to their forward line having an off-day. When Drum couldn’t get the ball to stick with Rory O’Reilly and Ryan O’Hara, they became too predictable with their short game and it allowed Vale to hem them into their own ‘45 and see out a three point win much more comfortably than it should have been. Conor O’Kane inadvertently blocked a goal-bound ‘45 from Ryan O’Reilly that night which would have given Drum a second half lead and in a game between two excellent counter-attacking teams, any sort of lead is vital. Expect little to change for this weekend’s final but how much Drum have managed to learn from that Celtic Park encounter could be key. ‘Vale are still the team to beat and have the players to defeat any team at this level but Drum know their efforts this season deserve reward. ‘Vale are favourites but Drum enjoy the underdogs tag so while the form guide comfortably says St. Mary’s, expect it to be a lot closer than that.